Fuel: Petit dejeuner (cafe au lait, bread, jam, butter), ham baguette, packet of orange jelly energy sweets, lemonade, Coke Zero (I may have a problem…), salami and baguette. We didn’t want to get up. Mat had one thing on his mind, and for once it wasn’t coffee. He needed to see if he could push something else out. Last night had been a small victory – a very small victory – and now he needed to not just win the battle, he needed to win the war. But in Mat’s words (and I’m really sorry in advance), “it was like weeing out my bum”. The next morning, with Mat’s business taken care of, Michel, the most French man I’ve ever met, served us a petit dejeuner of bread, jam and really good coffee. There’s a lot to be said for keeping it simple, people! 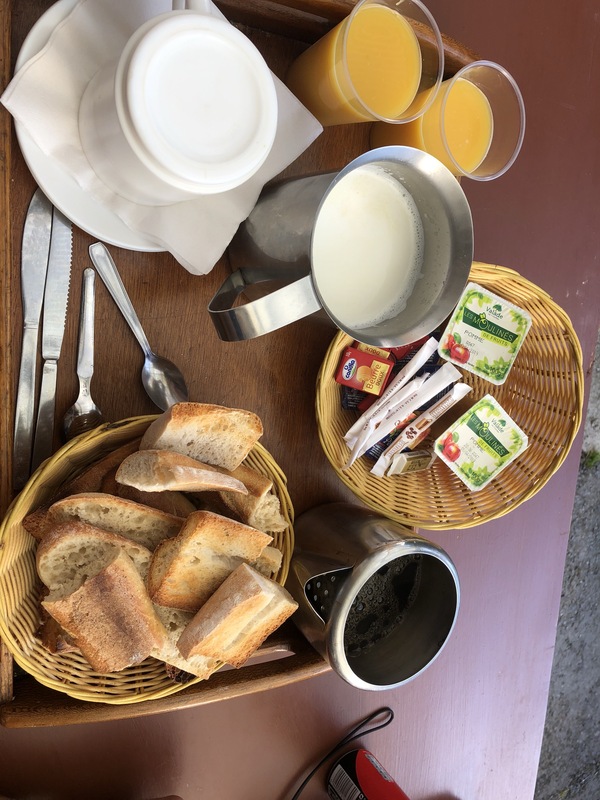 Whether we wind up at a gite, an auberge or a cafe, they all serve the same tasty breakfast. No avocados, no eggs, no sautéed mushies. Just really good bread, butter, jam and coffee. Sure, we couldn’t ask for anything else even if we wanted to, our French is so shite, but this always hits the spot. 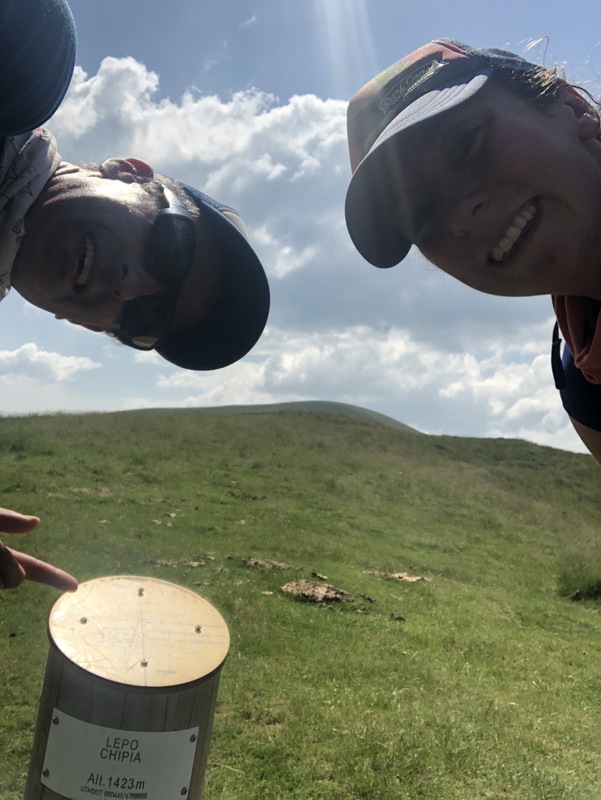 Up was the order of the day – 1840m over 24km. We were really worried about the heat (34 degrees forecast) but an incredibly cool wind meant we barely felt the sun beating down. 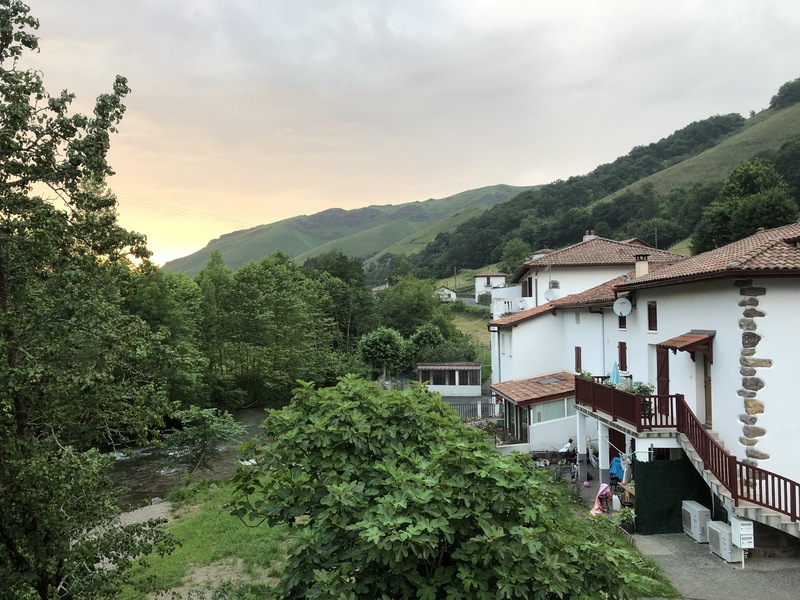 For five hours we were blown up and across the hills, until eventually we made it to Chalet Pedro, a haven of wine and cider hidden beneath a forest. We had lemonade and a ham baguette, knowing there were still a good few hours to go yet. 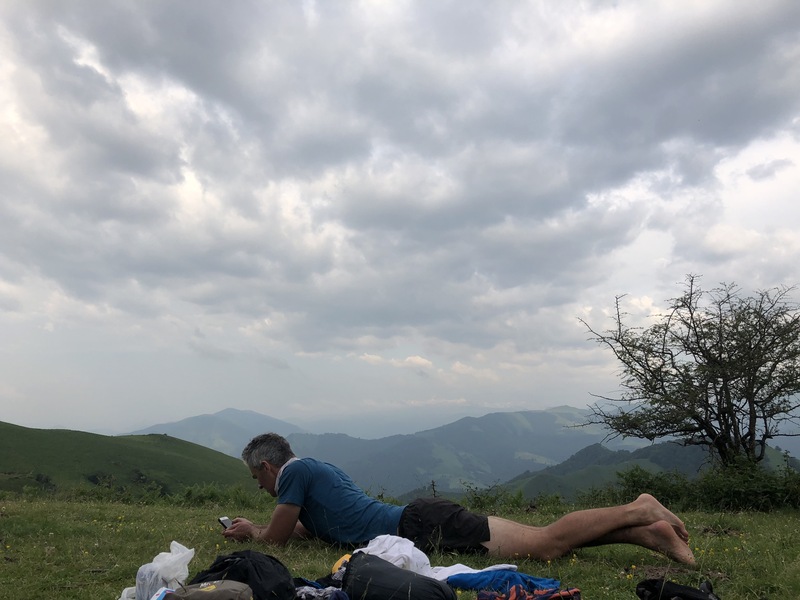 We hadn’t really decided what to do next – it was 2 hours til the next gite (a kind of basic hikers hotel) but we were feeling better than anticipated. “See how we feel when we get there”, we decided. And then the cool wind stopped. We spent two hours begging the skinny trees for shade. Arriving at Col Bagargiak, we guzzled a couple of icy cokes and just stopped. And what a place to stop. A tiny village of ski huts and chalets is perched at 1327m overlooking a vista of snow-capped mountains. Road cyclists were sweating up the mountain, stopping to grab a drink from a busy aid station before heading back down. You can imagine how incredible the Tour De France would be here. Cooled and quenched, we talked ourselves into running another 10km to find a campsite above the next village. Brilliant idea – at first. But as we approached farm after farm after farm, it became a game of who will move first – Mat or the cow? After what seemed like another day, we finally arrived at a grassy hummock that we liked. Mat threw his bag down and collapsed into the grass, perfectly placed between a few old dried cow pats.